From left: Stephen Thomas, GCCVB Assistant Director Kaitlynn Halley and Kelsie Kerr, co-manager of the Artisan Shoppe and Studio. 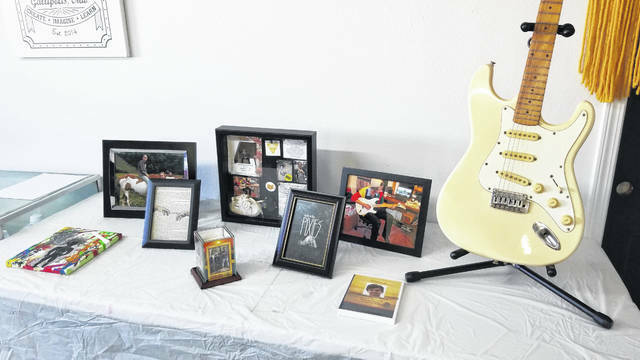 A remembrance table for Nathaniel Thomas. 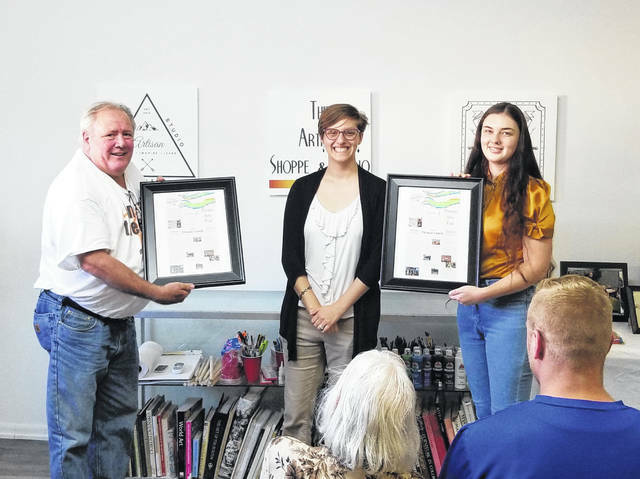 GALLIPOLIS — In an effort to bring awareness to Gallia County’s thriving arts community, the Gallia County Convention and Visitors Bureau officially dedicated its newest initiative, the Thomas Arts Trail, during a ceremony held at the Artisan Shoppe & Studio on Friday. The trail features the French Art Colony, University of Rio Grande Greer Museum, the Artisan Shoppe & Studio, Raised Around Rio Farmer and Artisan Market, the Ariel-Ann Carson Dater Performing Arts Centre and BoardRoom 46. “Each of these organizations is committed to the artist culture of Gallia County. Family and community are at the forefront of this area and we are lucky to have a strong collection of artists who work hard to enrich our community,” said GCCVB Assistant Director Kaitlynn Halley. The trail was dedicated to local young artist Nathaniel Thomas, who passed away in 2017, as a way to honor both him and his family. Halley then presented plaques honoring the dedication to his father, Stephen Thomas, and his sister and co-manager of The Artisan Shoppe & Studio, Kelsie Kerr. “Nathaniel was very creative. He was very sensitive. He was artistic,” said Thomas after accepting the plaque. He told the story of a road trip to Athens with Nathaniel when he purchased a ukulele for him. By the time they’d made it back from Athens, Nathaniel had already studied the book they purchased and was playing songs. “I think about him every day and he’s always going to be my buddy. I know that he and I will meet again and that comforts me,” Thomas said before thanking the crowd for attending. A plaque was made for each location designating it as part of the Thomas Arts Trail. For more information about the Thomas Arts Trail, visit the Gallia County Convention and Visitors Bureau at 441 Second Avenue, Gallipolis or call (800) 765-6482.